Mauricio Pochettino’s side took the lead through Sanchez’s first half header, but they were indebted to Lloris for keeping out Jamie Vardy’s spot-kick after the interval at Wembley. 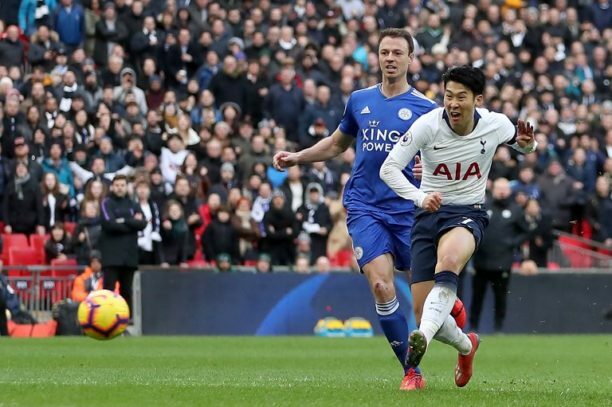 Christian Eriksen netted moments later and although Vardy got one back, Son Heung-min’s late strike ensured third-placed Tottenham clinched a fifth win in their last six league games. Tottenham kept pressing and were rewarded with a well-worked 33rd minute opener. Trippier’s short corner found the unmarked Christian Eriksen and he whipped a pin-point cross towards Sanchez six yards from goal. Replays showed the Colombian defender was just onside as he scored his first goal for Tottenham since his 2017 move from Ajax. Leicester’s positive start to the second half brought a golden opportunity to equalise with their 60th minute penalty. Vardy gave Leicester hope in the 76th minute, pouncing from close-range to convert Pereira’s cross in typically predatory fashion.